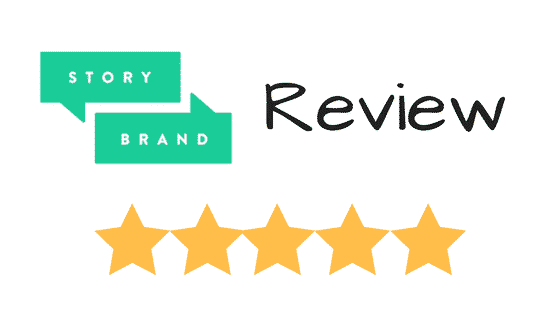 For those who are sitting on the fence about purchasing the StoryBrand Workshop, this StoryBrand Review is for you. With the aim of giving you an honest insider’s view of StoryBrand. Since I live in Australia, I purchased the StoryBrand Online Workshop. One day, I would love to visit the USA and attend a live StoryBrand Workshop. So until that time, this review will focus on the online version. I can only imagine the live version would be similar but better. If you’re reading this page, I would assume you already know what StoryBrand is but for the sake of completeness, I’ll give you a quick summary. It’s a marketing workshop designed for business owners (small, large & non-profit) who want to create a clear message for their business. The founder Donald Miller has been studying story for over a decade and realised that the same formula for story writing could be applied in the business world. Not a story about the business but about their customers. This key paradigm shift that we make is the customer is the hero of the story, not the business. The business becomes the guide in the customer’s story. If you haven’t already, I would highly recommend, go and sign up to the 5 Minute Marketing Makeover. It’s completely free and a great way to get started. You will have to give Don your email address but he will send you great valuable content and you can unsubscribe at any time. The course is broken up into three sections, Core Concepts, 7 Modules and Execution. Each module is a component of the BrandScript and you will work through the module to come up with your own BrandScript. Each module has a series of videos, that contain recorded versions of Donald Miller talking at the Live Workshop. You will get access to a downloadable blank BrandScript PDF that you can print off and fill out. As I’ve come to expect with Donald Miller, he always over delivers. At the end of the course, your will get access to some bonus material called “StoryBrand Experts Academy”. There are more videos & eBooks that allow you to take the concepts even further and it’s all great stuff. To be honest, there is that much extra content, I haven’t even gone through it all yet. Another great part about joining StoryBrand is having access to their community. They have created a Slack team for StoryBrand Alumni members (students who have completed the course) to chat & discuss ideas. One channel inside the team is call #peer-feedback. This is a great place where you can post your BrandScripts or any marketing material and receive feedback from the community. Everyone in there is very helpful and positive. This is the big one for most. The StoryBrand Online Workshop at the time of writing cost $1495 USD. Unlucky for me, with a low Australia dollar, it cost me $2033 AUD. But my take on it, that’s a bargain. The investment will pay for itself in no time. If you don’t invest in your business how do you expect anyone else too? But it’s not always about the price. It’s about spending that money on something you believe to be worthwhile. I mean if your Facebook feed is anything like mine, there are people trying to sell me a new course every day, promising the world. I’m sure many live up to their promises if you take action. And you will only take action if you believe in the concept. So you need to find the right course for you. Something you believe in and not some course that will make you rich quick, with no work. StoryBrand is great but you still need to work at it. For me, if you like the 5 Minute Marketing Makeover and you like things clear and concise. Kind of like the way Apple produces products, then this is for you. So to sum up this StoryBrand Review by Tim Millard, I give it 5/5 stars. If you have been enjoying all the free material that Donald Miller puts out, then I would suggest you are going to love this Workshop. Don seems to always over deliver with his free content and the paid StoryBrand Online Workshop is no exception. In order to be open, transparent and give you a real feel of StoryBrand, you can download my BrandScript for Digital Bear below. Disclosure: Why did I write this StoryBrand Review? No, there is no affiliate program, so I do not earn any commissions by referring you to StoryBrand. Nor was I paid in any way by the team at StoryBrand. I honestly just love the StoryBrand framework. The value that has been provided to me by Don & his team has been outstanding. This is a way to repay their generosity by giving back. I just want to provide great value. I know how hard it can be when deciding on making an investment into a course. Hopefully, this review will help someone make that decision a little easier. I design websites that follow the StoryBrand framework. My thinking is that some of you may want a new website or a redesign that follows the StoryBrand framework. By providing great value first, you may consider using Digital Bear, if not, that’s fine too. I just hope you enjoyed this review and got something from it. Learn more about Digital Bear. Did you like this review? Leave a comment below. Web Developer and Local Business Marketer.